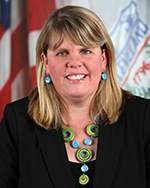 Mary McNamara was appointed by Mayor Frank G. Jackson as the Director of Aging in December 2016. Mary joined the Department of Aging team in 2008 and was a Project Coordinator and also an Administrative Manager before being named Director. She leads a dynamic and passionate team that is committed to making Cleveland more Age Friendly. She oversees the department’s home repair and maintenance services, social services. Aging and Disability Resource Center, safety programs, Age Friendly Initiatives and special events. Prior to her work at the city, she worked at Fairhill Partners and several faith based nonprofits. Director McNamara earned her undergraduate degree in Social Work from The Ohio State University and a Master of Science in Social Administration from the Mandel School of Applied Social Science at Case Western Reserve University. She is also a graduate of the Cleveland Management Academy through Cleveland State University. She holds an Independent Social Worker License with supervision designation from the State of Ohio. In 2016, she was named one of the 100 Centennial Alumni Award winners from the Mandel School of Applied Social Sciences. Mary lives in the Detroit Shoreway neighborhood.